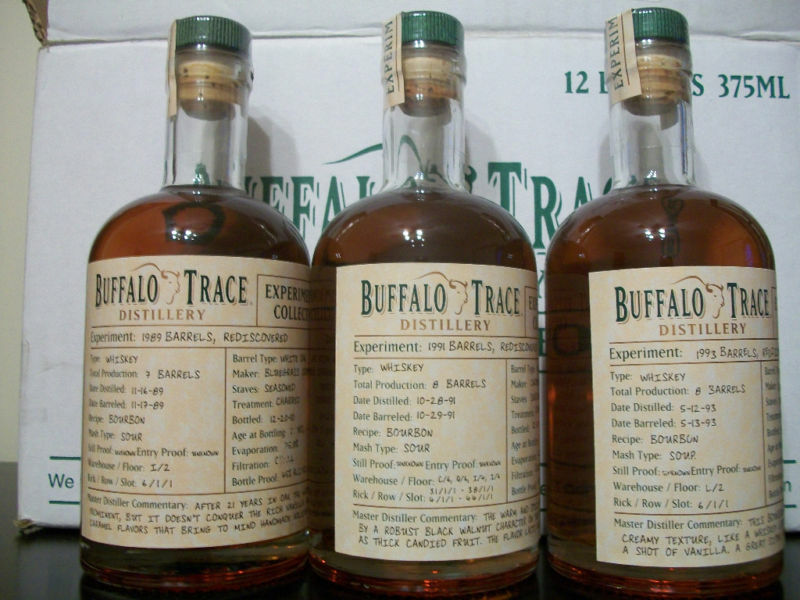 FRANKFORT, Franklin County, Ky (May 1, 2012) – One year ago Buffalo Trace Distillery unveiled its Single Oak Project and its quest for the perfect bourbon. Now as the fifth round of Single Oak Project Bourbons are released, there has been much excitement and many reviews, but still many questions to be answered. The fifth round of experiments will focus on three variables, the recipe, rye vs. wheat; the entry proof, 105 vs. 125 proof; and wood grain size, tight, average, or coarse. All of the other variables such as barrel stave seasoning, aging warehouse, char level, and tree cut (top or bottom) remain constant. 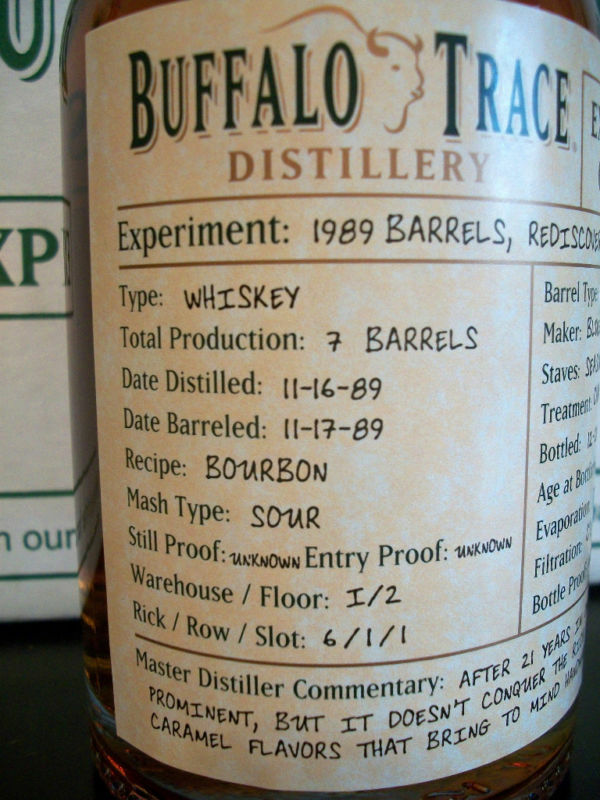 As with the other four releases, Buffalo Trace hopes whiskey enthusiasts can continue to rate each whiskey they taste online at www.singleoakproject.com. To date, more than 1700 accounts have been created online, and nearly 1,550 reviews have been given on the four various releases so far. The whiskey reviews have been tallied and the leading barrel after one year is…. a three way tie!! Barrels #10, 106 and 184 are all tied for first place. With all three of those barrels having different variables, it seems the only thing the three have in common is that the oak was harvested from bottom half of the tree! The other six variables of the leading barrels vary. 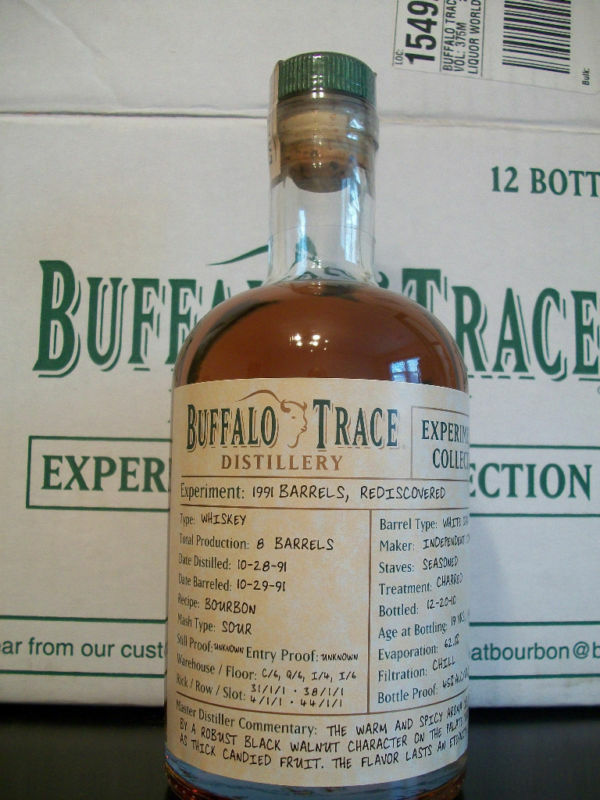 After a consumer reviews a bottle online, they will be availed of all the aging details and provenance of the barrel. They can interact with others who’ve also reviewed the barrel, compare their reviews, and even learn for themselves which characteristics they enjoy most, in order to help them select future favorites. Participants online will earn points after each review and most importantly, help Buffalo Trace Distillery create the perfect bourbon! 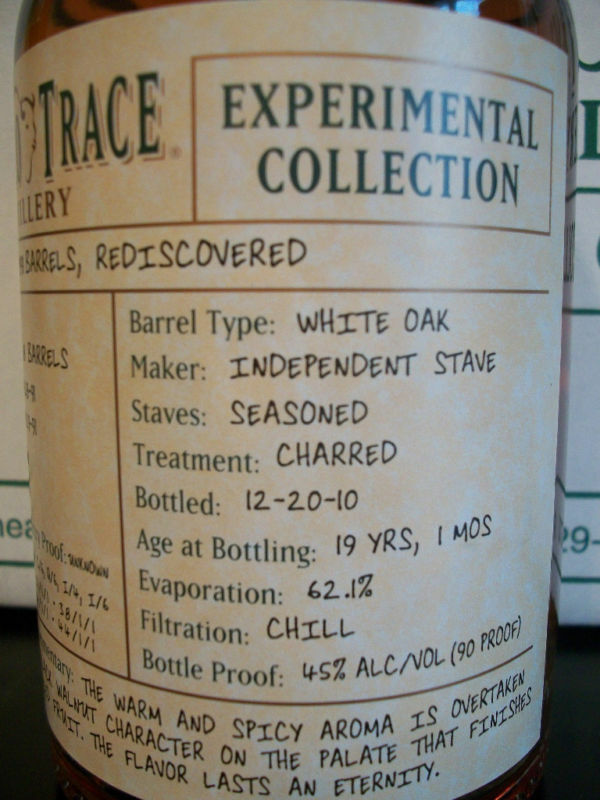 The Single Oak Project is part of an intensive research project Buffalo Trace Distillery started conducting in 1999 by hand picking 96 trees with different wood grains and then dividing them into a top and bottom piece, yielding 192 unique sections. From there, staves were created from each section and were air dried for either 6 months or 12 months. After all the staves were air dried, a single barrel was created from each tree section, resulting in 192 total barrels. These barrels were given either a number three or a number four char and then filled with either wheat or rye recipe bourbon. 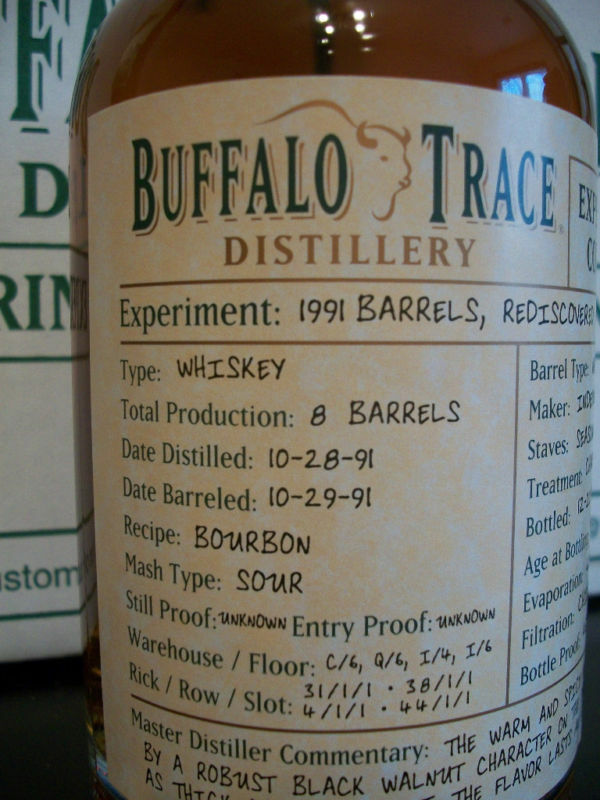 To further the variety of experiments, the barrels were filled at two different proofs, 105 and 125 proof. And if this wasn’t enough, two completely different warehouses were used, one with wooden floors and one with concrete floors. 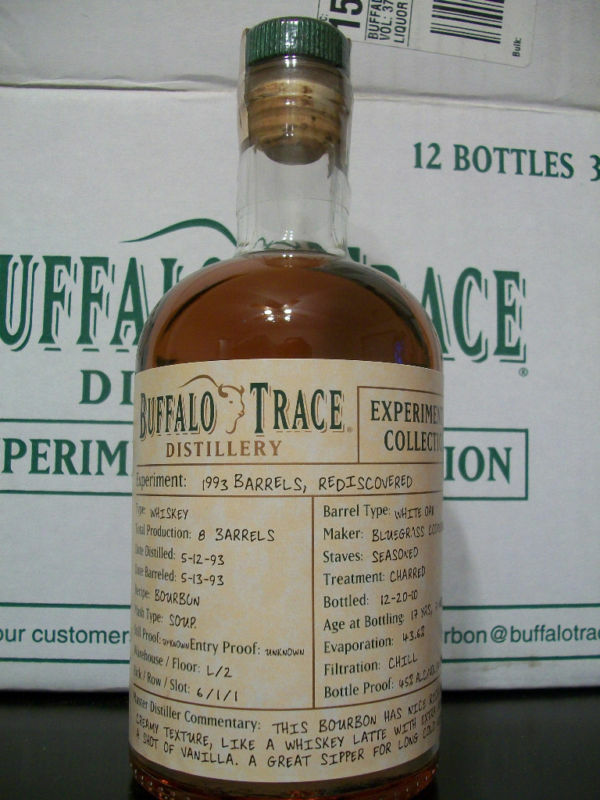 In total, seven different variables were employed in Buffalo Trace’s ultimate experiment. For eight years the Distillery continued with its tracking process, creating intricate databases and coming up with a potential of 1,396 tasting combinations from these 192 barrels! The Single Oak Project Bourbon is being released in a series every three months from 2011 through 2015 until all of the 192 barrels have been released. The first releases hit select stores in 2011. This fifth release will reach stores towards the end of May. Like all the other releases, the quantities are very limited. Every case will contain 12 bottles, each from a different barrel. The fifth release is made up of barrel numbers 1, 17, 33, 49, 65, 81, 97, 113, 129, 145, 161, 177. All releases will be packaged in a 375ml bottle. Suggested retail pricing per bottle is $46.35. BARDSTOWN, KY – Heaven Hill Distilleries, Inc., the nation’s largest independent family-owned and operated spirits producer and marketer, announces the first two releases of the Trybox Series of New Make Whiskeys. The new Trybox Series, named after the copper and glass “tasting station” where new make whiskey flows off the still, offers up several styles of Heaven Hill’s world famous American Whiskeys. Each is taken straight off the still, before aging in a charred oak barrel–the same way legendary father and son Master Distillers Parker and Craig Beam taste-test them. The first two releases in the series, available at retail starting in May, will be New Make, which if barrel aged would become a Straight Bourbon such as Evan Williams Single Barrel Vintage; and Rye New Make, which if aged would become Rittenhouse Straight Rye. Future plans call for the release of other varieties of American Straight Whiskey as new make, as Heaven Hill Distilleries is the only American Whiskey producer that distills Bourbon, Rye, Corn and Wheat Whiskeys. The Trybox Series is available in a 750ml bottle size, packaged three to a case, and is bottled at the full traditional barrel entry proof of 125, or 62.5% alcohol/volume. The suggested national average retail price will be $24.99, and it will launch in most markets across the country. The Trybox Series is offered in an upscale package, contemporary yet with elements that are based on traditional distillery sample bottles. The labels detail the “Main” and “Secondary” grains used in that particular whiskey, and subtle color changes differentiate each whiskey style. All the bottlings will utilize a rich, metallic copper cap, hearkening back to the copper stills so important for American Whiskey distillation. New make whiskey, traditionally referred to by distillers as “White Dog”, is American whiskey in its most raw and elemental form. It is a very different sensory experience than barrel aged whiskey, offering up grainier and sharper aromas and flavor notes. Cutting edge mixologists today are discovering new uses for new make whiskey as a unique and appealing cocktail base. The New Make uses the same grain recipe, or mashbill, as nearly all of Heaven Hill’s award winning Bourbons, including Evan Williams and Elijah Craig. By law, Bourbon must contain a minimum of 51% corn in the mashbill, traditionally combined with malted barley and either rye or wheat. Heaven Hill’s Bourbon formula, however, and most of the other larger distilleries, has always contained a much higher percentage of corn than the legal minimum. Heaven Hill also uses one of the highest percentages of malted barley in the industry, despite the fact that it is the costliest grain in the process, because it not only aids in fermentation conversion but it also adds a distinctive earthy sweetness to the distillate. The Rye New Make utilizes the traditional Heaven Hill rye mashbill , the same that is used to produce world-renowned Rittenhouse Rye. The Rye New Make adds an element of spicy, sharp fruitiness to the taste. FRANKFORT, FRANKLIN COUNTY, KY – Every once in a while at nearly every large distillery, a barrel warehouse employee will run across a barrel or two that has seemed to be in hiding for a number of years. They’re like little gems, concealed within the dark corners in the back of a rick just waiting to be rediscovered and sampled to see what treasures lie within. 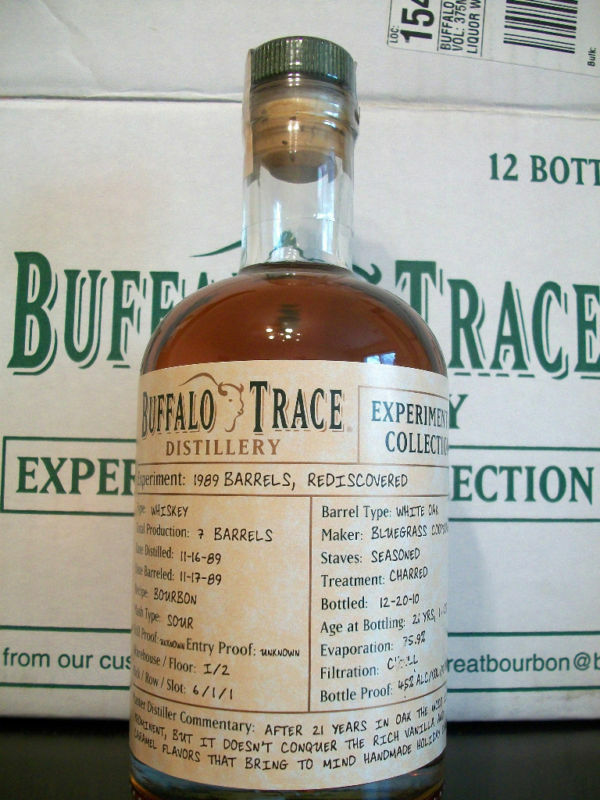 Such is the case at Buffalo Trace Distillery, where a batch of barrels, some as old as 21 years, were rediscovered, tasted, and now bottled under the highly acclaimed Experimental Collection moniker. “In 1998 we acquired the Old Charter brand, along with a large inventory of barrels, approximately 150,000. In a recent audit of our barrel inventory, we found some barrels from this lot. One was empty, one tasted horrible, and the others tasted very nice. Of course we bottled the very nice barrels and are offering these rare finds under our Experimental Collection label,” said Kris Comstock, bourbon brand manager. •	1989 Barrels, Rediscovered: These seven barrels were filled on Nov. 17, 1989. The still proof and entry proof are unknown. After more than 21 years of aging, the wood is very prominent, but it still doesn’t conquer the rich vanilla and caramel flavors that bring to mind handmade holiday candy. •	1991 Barrels, Rediscovered: These 8 barrels were filled on Oct. 29, 1991 and the still proof and entry proof are unknown. After a little more than 19 years, the warm and spicy aroma of this bourbon is overtaken by a robust black walnut character on the palette that finishes as thick candied fruits. The flavor lasts an eternity. •	1993 Barrels, Rediscovered: These 8 barrels were filled on May 13, 1993 and like the other two offerings in this collection, the still proof and entry proof are unknown. After 17 years and 7 months in the barrel, this bourbon has a nice rich and creamy texture, like a whiskey latte with extra foam and a shot of vanilla. A great sipper for long cold nights. 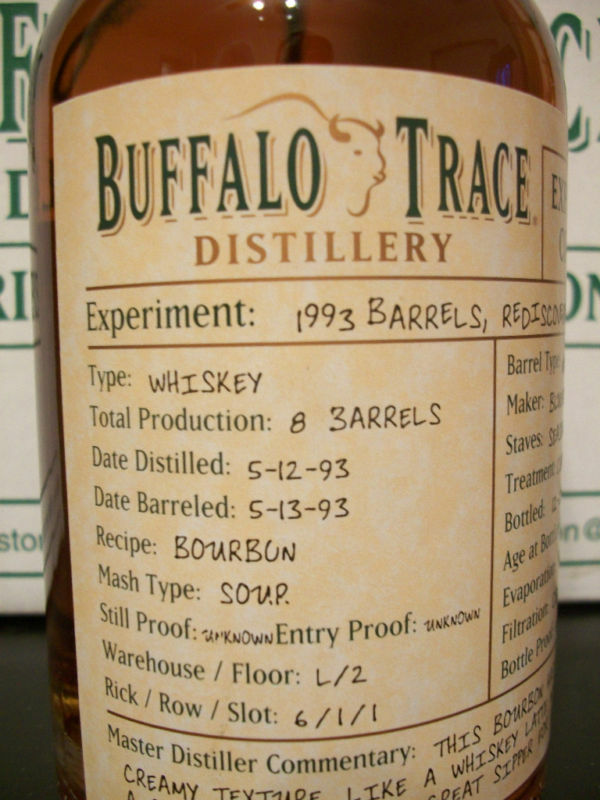 There are more than 1,500 experimental barrels of whiskey now aging in the warehouses of Buffalo Trace Distillery. Each of these barrels has unique characteristics that differentiate it from all others. Some examples of these experiments include unique mash bills, type of wood and barrel toasts. In order to further increase the scope, flexibility and range of the experimental program, an entire micro distillery complete with cookers, fermenting tanks and a state-of-the-art micro still has been constructed within Buffalo Trace Distillery. The Experimental Collection will be packaged in 375ml bottles. 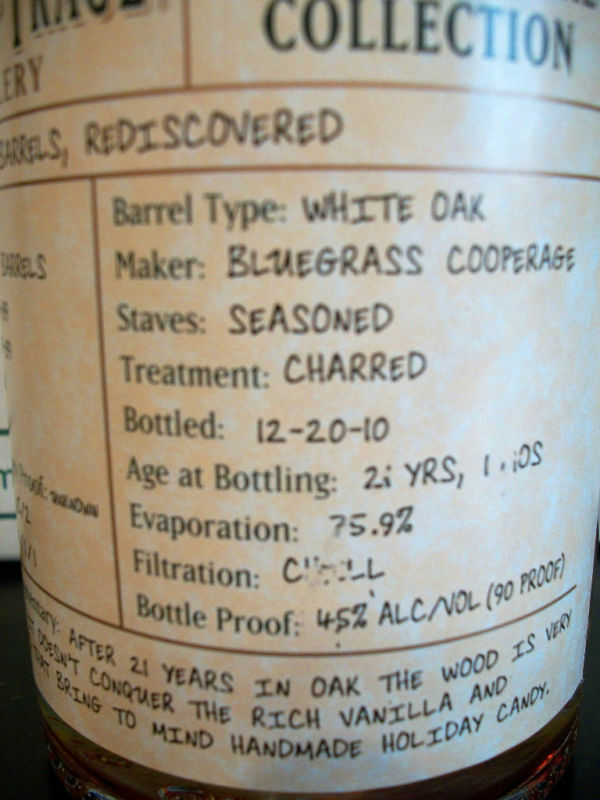 Each label will include all the pertinent information unique to that barrel of whiskey. These whiskeys will be released in February 2011 and retail for approximately $46.35 each. Each experiment is very rare and very limited. Bulleit Distilling Company is set to fire off a new rye whiskey on March 1st. The release of Bulleit Rye Whiskey will be marketed and sold nationally in the US. It will have a suggested retail price of $27.99 per 750ml bottle. It is being referred to as“Bulleit 95 Rye” and reads as such on the label. Bulleit Rye is a Straight Rye Whiskey, offering a 95% Rye Mash Whiskey and 5% Malted Barley, which makes it among the highest ryes available in the market. 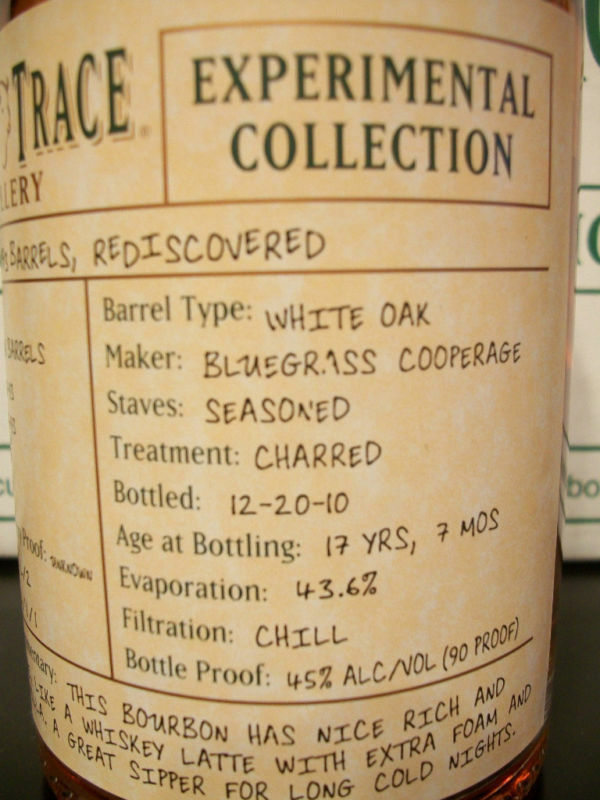 It is aged and matured between 4 and 7 years, bottled at 90 proof, 45% (ABV) and is produced in Lawrenceburg, Indiana. BourbonBlog.com confirmed this information with Tom Bulleit today. Be sure to check out BourbonBlog.com for more info and a recipe that includes the new Bulleit Rye. For the readers that are unfamiliar with rye whiskey, it a brother to bourbon whiskey. The main difference is that rye contains at least 51% rye, while bourbon contains at least 51% corn. Most ryes contain some corn, however, Bulleit Rye will be 95% rye and not contain any corn. It will be interesting to taste this whiskey and see if it stands out. As always, if you get a taste of this juice anytime soon, be sure to leave a comment and let us know what you think. Cheers!